Congratulations, you’ve just been cast in your first slasher movie! You’ve been given your big break by the notorious Director X. His methods have produced some of the finest grindhouse films ever committed to celluloid. Famous faces and big names are not what this director is looking for. Fresh faces are all Director X casts, and with your embarrassingly empty resume you’re as fresh as they come! But seven other hopefuls are also in the running, so you’re going to need to prove your worth if you’re to hit the leading credits. You’re going to have to scratch, claw and strike to slash your way to the top. This job’s going to be murder! Developed by Outerlight, Bloody Good Time takes a new and irreverent approach to multiplayer shooters. The game runs on the Valve’s Source engine, known for classic multiplayer shooters such as Half-Life and Team Fortress. From Spring Break Beach to the Horror House to the Vegas Hotel, discover what’s behind the Hollywood set in these unique multiplayer maps. 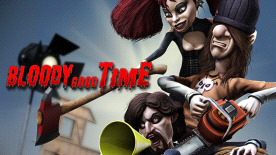 Running on the Valve’s Source engine, Bloody Good Time comes from the same pedigree of classic, online multiplayer shooters such as Half-Life, Team Fortress and Counter-Strike.